Holidays, birthdays, anniversaries, there are many wonderful occasions that are perfect for a jewelry gift, but none are quite as meaningful as a wedding. The jewel immediately becomes part of a couple’s love story and will bring back memories of the big day whenever a bride wears it. The British Royal Family has long participated in the custom of giving a bride jewelry. Meghan Markle received several pieces before she married Prince Harry. Platinum and diamond jewelry makes an ideal wedding gift. The metal and gem combination not only match a bride’s white dress to perfection, it also communicates an everlasting message of a very special piece of jewelry. Just remember, when you are considering what to buy, keep the bride’s style in mind. 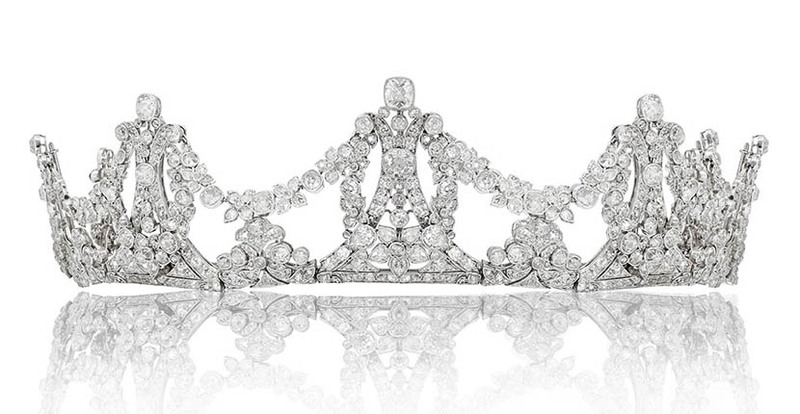 Clearly, a tiara is extravagant option to gift a bride. Madonna wore the Edwardian platinum and diamond tiara above when she married Guy Ritchie on December 22, 2001. It was made around 1910 by Asprey & Garrard of London and is now in the archival collection at Beladora in Los Angeles. See alternatives a bride can wear every day after her wedding or on special occasions in the story I created in partnership with our friends at platinumjewelry.com. The Sweetest Platinum Jewelry Ever!